Come ChiIL out with ChiIL Mama at Women Driving Excellence. We've been covering the Chicago Auto Show for years now and 2014 is no exception. Our media credentials just arrived in the mail, so we'll be taking a sneak peek tour this Thursday during press day. Friday, we'll be back with our social media friends for an Instagram video shoot/contest, and lots more happenings. Click here for loads of our past photo and video filled Chicago Auto Show Coverage from 2013 & 2012. Finally, We're very excited to be one of the official bloggers invited to cover the Women Driving Excellence awards, ChicagonistaLIVE, clips from Broadway in Chicago's Phantom of the Opera and more on Women's Day, February 11th. Come on out and join us for Women Driving Excellence! Why? Women Driving Excellence is celebrating women who start, accelerate, fuel, and steer others to excellence. Click here for more details. ChicagonistaLIVE is once again hosting their Annual Women Driving Excellence - the feature Women's Day Event of the Chicago Auto Show that they are coordinating with the Chicago Tribune, RedEye, and Cars.com! Besides honoring women like Sherren Leigh of TCW magazine, BlogHer founders, and more, we're excited about all the other entertainment joining us such as Broadway in Chicago's Phantom of the Opera. A real treat to all! There is an opportunity to network too. Meet and get inspired by eight women who start, accelerate, fuel and steer others to excellence at the 2014 Chicago Auto Show on Feb. 11, 2014. 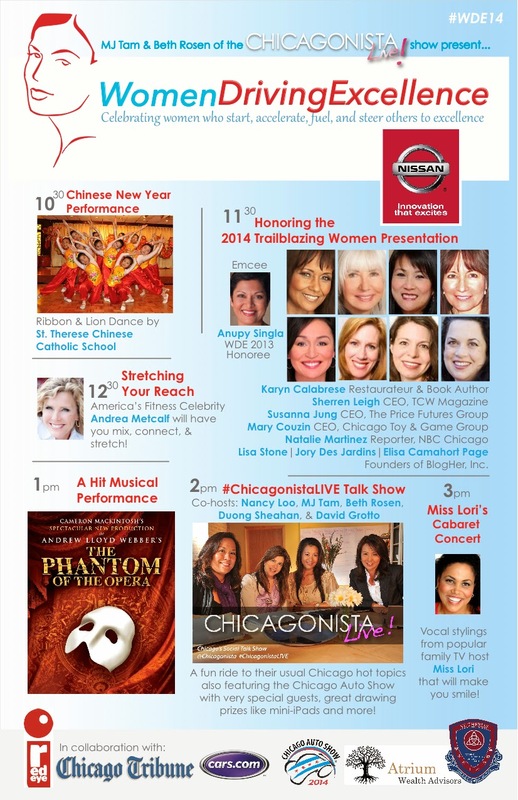 Join ChicagonistaLIVE!’s MJ Tam and Beth Rosen, the Chicago Tribune and Nissan at McCormick Place North (2301 South Lake Shore Drive) on Feb. 11, 2014 to kick off the 2014 Chicago Auto Show’s Women’s Day with the second annual Women Driving Excellence (WDE) event. WDE honors trailblazing women who start, accelerate, fuel and steer others to excellence. This year, eight amazing women – Karyn Calabrese (restaurateur and author), Mary Couzin (CEO and Founder of Chicago Toy and Game), Jory DesJardins, Elisa Camahort Page and Lisa Stone (BlogHer founders), Susanna Jung (president and CEO of Price Futures Group), Sherren Leigh (CEO of Today’s Chicago Woman magazine) and Natalie Martinez (NBC Chicago reporter) – will receive recognition for their outstanding efforts. 2013 WDE honoree Anupy Singla (celebrity author and entrepreneur) will emcee this event and guests will enjoy a free gift (while supplies last) and several live performances from Broadway in Chicago, St. Therese Chinese Catholic School, Miss Lori, Andrea Metcalf and more. Women Driving Excellence is a program created by social media mavens and ChicagonistaLIVE! social talk show hosts MJ Tam and Beth Rosen to inspire women to accomplish greatness by empowering and engaging other women. This program discovers and recognizes women that exemplify unique vision and talent and celebrates them via Tam’s and Rosen’s powerful social networks. Social media producer and multimedia storyteller MJ Tam is the editor of Chicagonista.com, creator of City Connect Media, Inc. and creator and co-host of ChicagonistaLIVE! - a monthly talk show that is streamed worldwide. Tam’s extensive experience working with major brands like Google, Microsoft, Nintendo, etc. has made her an in-demand expert on blogger-brand relationships. Beth Rosen is a leading-edge social media strategist whose versatility and expertise in media and promotional arts allows individuals and companies to realize their full potential on Twitter, Facebook, podcasting, blogging and more. Rosen is also a ChicagonistaLIVE! co-host and draws upon her vast experience as a radio, film and commercial producer to structure, implement and maintain highly focused and beneficial social media campaigns for businesses. Registration is now open and we would love it if you can join us. We hope to see YOU there. Click this Eventbrite link to guarantee your FREE spot. Like Women Driving Excellence on Facebook and follow them on Twitter @Wodrex for all the latest updates and info. Follow my tweets @ChiILMama on the day of, to keep up in real time. And check back with ChiIL Mama like we vote in Chi, IL... early and often for all our photo and video filled Chicago Auto Show 2014 recaps.